A painter, printmaker, draughtsman and sculptor, Alun Leach-Jones was one of Australia’s most prominent abstract artists. He is best remembered for his idiosyncratic hard-edged style of painting. As a mentor and teacher, he was responsible for fostering the careers of many younger Australian artists. Born in 1937 in the village of Maghull in Lancashire, England, Leach-Jones spent his childhood in Glasfryn, North Wales. From 1955 until 1957 he studied at Liverpool College of Art. In 1959 he travelled to London to see the exhibition New American painting at the Tate; the abstract expressionist works he encountered there were pivotal in challenging the way he thought about form and colour. 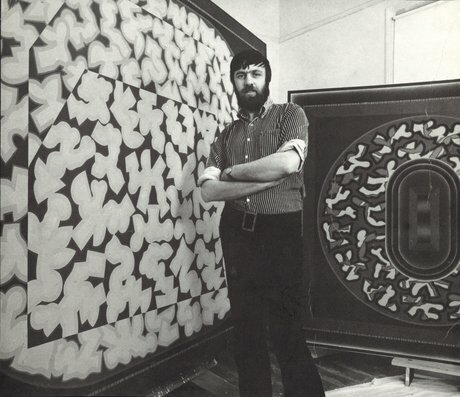 In 1960, Leach-Jones emigrated to Australia, where he enrolled at the South Australian School of Art, studying printmaking under Udo Sellbach and painting with Charles Reddington. In Adelaide, he mixed with other talented and ambitious young artists including Syd Ball, Robert Boynes and Barbara Hanrahan. He also met his wife there – fellow artist Nola Jones (née Wilkins) – and in 1964 they travelled to London. She studied at the Chelsea School of Art, while he became involved in the Contemporary Art Society. They returned to Australia in 1967, settling in Melbourne. The same year Leach-Jones held his first successful solo exhibition at the Australian Galleries in Collingwood – the first of more than 80 solo exhibitions he would hold over the years. During this period in Melbourne Leach-Jones developed his meticulous hard-edged painting style and secured his reputation as one of Australia’s leading abstract painters. He was included in the landmark 1968 exhibition The field at the National Gallery of Victoria and, the next year, represented Australia at the Bienale del Sao Paulo in Brazil. In 1969 Leach-Jones was appointed as a teacher at the Prahran College of Advanced Education. He also taught at the National Gallery of Victoria School. In 1972 he took up a teaching position at the Victorian College of the Arts, and in 1977 moved to Sydney as artist-in-residence at Macquarie University and to teach at the City Art Institute. A consummate printmaker, Leach-Jones worked with master printers Larry Rawling, Diana Davidson and Michelle Perry, among others, to print more than 150 editions during his career. He produced vivid screenprints with fields of flat colour and sharply defined edges, such as his India Suite , and worked with great virtuosity in black-and-white etchings and linocuts, such as the suite Cyprus and Acacia – a reaction against his high-colour works. In a career that spanned more than 45 years, Leach-Jones lived and worked in many international locations, including Berlin and New York. His work is held in numerous collections in Australia and overseas, including the Museum of Modern Art and Solomon R Guggenheim Museum in New York, the Victoria and Albert Museum and British Museum in London, the National Gallery of Australia and Australian state galleries. He was a generous benefactor to the Art Gallery of NSW, gifting 42 works during his lifetime. Alun Leach-Jones died in Sydney on 24 December 2017.